Nothing brings people together faster than a shared adversary. Or in Jack and Meg White’s case, nothing reunites estranged bandmates faster than a mutual hatred of Republican Presidential nominee Donald J. Trump. Following in a long line of politicians who misinterpret lyrics for their own use on the campaign trail (God, where to begin? Ronald Reagan vs. Bruce Springsteen, Isaac Hayes vs. Bob Dole, Sting vs. George W. Bush), Trump borrowed the White Stripes’ 2003 single “Seven Nation Army” in a campaign video. The band, which split up in 2011, immediately denounced the move in a Facebook post saying: “The White Stripes would like to unequivocally state that they have nothing whatsoever to do with this video. They are disgusted by this association, and by the illegal use of their song.” Then they went a step further, producing red “Icky Trump” T-shirts—a sneering take on their 2007 record. Okay, we get it. Meg was quiet and reserved and Jack was not. One is such a successful musician that he doesn’t have to tour OR do interviews (he was the only member of The Dead Weather not present when I interviewed them last year). Meg, on the other hand, has not been active in the music industry since The White Stripes broke up. Clearly they aren’t suited for partnership, marital or otherwise. That said, it is undeniably nice it is to see them—in some form—reunite to condemn Trump, a frightening political pretender who currently poses a very real threat to the nation he wishes to “serve” as President. Bummer that it has to be Trump serving as the impetus for their reconnection, as opposed to an anniversary or festival, but what can you do. Turns out it’s actually been scientifically proven that people are more likely to bond over a shared hatred of something than a shared enjoyment. 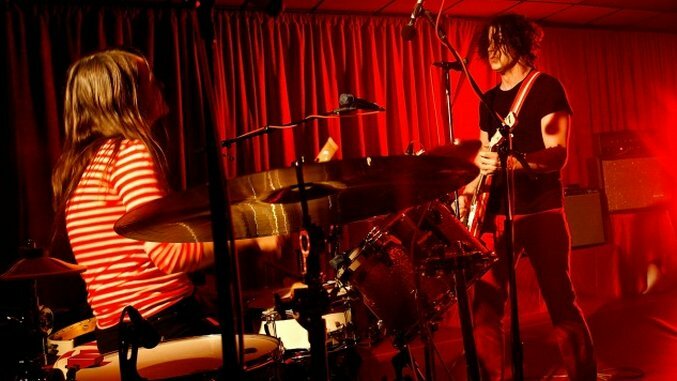 In 2011, the University of South Florida’s Jennifer Bosson found that, as New York Magazine wrote in their summary, “trashing the same person often helps people bond.” So it shouldn’t be surprising that The White Stripes jumped at the chance to set the record straight, so to speak. The threat of a Trump presidency is greater than them. If we can take anything away from this—short of wearing an “Icky Trump” T-shirt until November 8—it’s that audiences would do well to follow the Whites’ example. We should all do what we can, regardless of superficial differences, to demonstrate what we’d like the outcome of this election to be, whether that’s organizing a peaceful protest, writing a song, silkscreening a shirt, holding debate parties, writing an article (hey! ), or whatever else makes you feel productive. After all, you’re an immigrant too.